Created on Thursday, September 28, 2017. 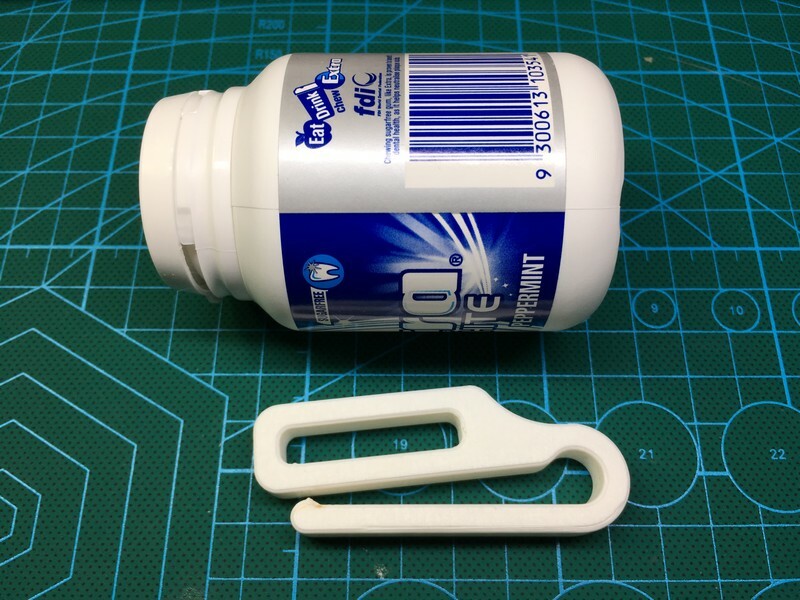 All the things I’ve worked out about how to use blue tape for 3D printing. It’s inexpensive. It costs about 50 cents to cover my platform, and I can keep using that layer until it wears down completely after 10–20 prints. You can find it in your local hardware store, so you don’t need to wait for stuff to come in the mail. It has very good adhesion for PLA and PETG. I haven’t personally tried ABS yet, but RepRappers say it sticks. It can be used on an unheated bed (PLA and PETG only). You can damage it without feeling bad. Can’t say that about BuildTak! It leaves a pleasant and clean surface on the bottom layer – if you’ve tuned your settings right. A lot of people have moved on from blue tape to other surfaces like PEI or glass, and indeed many printers now come with a PEI build surface so that newbs can skip all of that and just start printing. But I really like blue tape and I want to help you like it too. This document contains all the things I’ve worked out about how to use blue tape, from what to buy, to how to lay it down, to how to print on it and get it just right. ‘Blue tape’ is 3M Scotch-brand #2090 Original Multi-Surface painter’s tape, as wide as you can find it. I use the 49 mm width. You can buy very large sheets of blue tape that are large enough to cover your whole bed at once, but I don’t know who manufactures that and I’ve never worked with it. Blue tape is not 3M Scotch-brand #2097 Exterior. I could not get anything to stick firmly to this tape even after wiping it with alcohol, wiping it with acetone, or rubbing it with sandpaper. It will stick for the first layer, but then curl up almost instantly as soon as the next layer hits it. The brand name is also printed on the backing of this tape, and it gets transferred to the bottom layer of the print even if you’ve scrubbed off as much of the ink as you can using acetone. Finally, other people report success with different 3M tapes like green tape (#2055), but I have not tried these. People report that green tape sticks to the bed more strongly than blue tape does, but both blue and green tape are labelled ‘medium adhesion’ by 3M, so I sort of doubt it. Finally, 3M does create a heat-resistant version of green tape, but I have not had any issues at all using normal #2090 blue tape on a heated bed. Remove any old surface treatments from the bed with rubbing alcohol or acetone and a lint-free cloth. Allow it to air-dry for a few seconds. Don’t skip this step. The tape needs to adhere well. Begin laying tape strips diagonally on the bed, starting from a corner and working across. Do not touch the clean bed with your fingers. Smooth each strip down with a clean plastic scraper. - Do not allow the strips to overlap; all adhesive tapes are coated with a release agent to prevent the roll from sticking to itself, so strips that overlap will not stick together properly. Remember: a gap is better than overlap! You should leave the release agent on the tape if you can – but if you need extra bed adhesion, you can wipe it off with some rubbing alcohol or acetone and a lint-free cloth. Why should I lay my tape out diagonally? 3D-printed parts tend to have a lot of straight edges. If those edges are close to the edge of a strip of tape, then the part will peel the tape up as it warps. You can position your object so that it spans multiple strips of tape, or you can rotate all of your parts by 45° when you slice them, or you can lay the tape diagonally and not think about it anymore. The difference is significant on an unheated bed. The table below shows how corner-curling is influenced by the direction that the tape is laid down. This was done on an unheated bed, so the curling is huge compared to the numbers I show later in this article. The test object was a 30×30×5 mm box with rounded corners. ‘Corner shrinkage’ is how much the corners of a box have shrunk compared to the center of the box. ‘Corner gap’ is how far the corners have risen off the bed, and it was measured by clamping the box to a flat plate and using a feeler gauge to measure the gap between the plate and the corner. 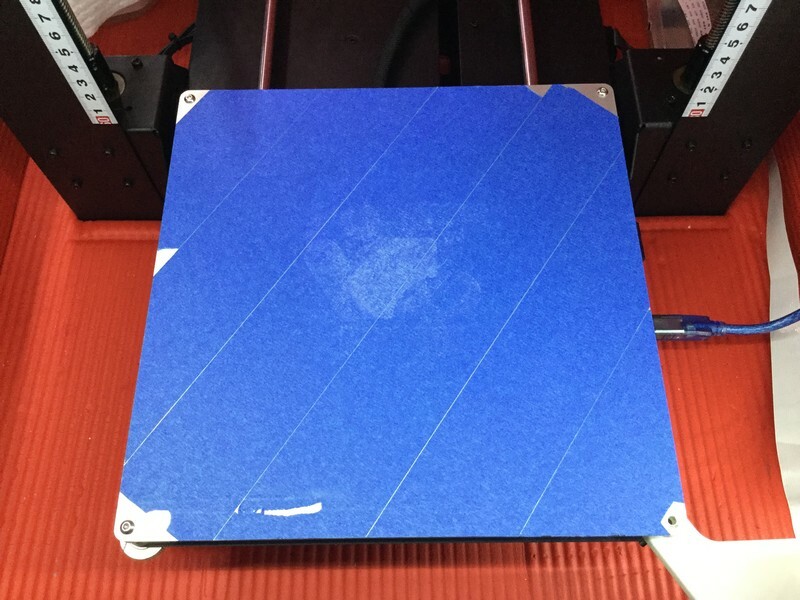 The most important things for blue tape are nozzle distance (AKA first layer height) and first layer temperature. The easiest way to tune nozzle distance is to start too close to the bed and work your way back. For example, for a 0.20 mm layer height you might start with a 0.10 mm nozzle distance and rise by 0.02 mm until you find a nice height. The lines should be laid perfectly beside each other, making full contact with the neighbouring lines. The line should be pressed down, but not completely flattened. If you observe the edge of the line becoming wavy as it is extruded, you are too close. When you run your finger parallel to the lines, the surface should be smooth. Any roughness means that you are too close. Are you sure your nozzle distance is correct? Use a feeler gauge to measure and set it properly. Disable the cooling fan for the first layer. Print the first layer at +10 °C nozzle temperature. Print the first layer at +10 °C bed temperature. Print the first layer more slowly. Finally, try scrubbing the release agent off the tape. You shouldn’t need to sand blue tape. You shouldn’t need to put glue or hairspray on blue tape. You shouldn’t need to grind the plastic into the blue tape with a low nozzle. Avoid doing any of these things. Not only do they mask the actual cause of your adhesion problems and create dimensional inaccuracy, but they also make the bottom surfaces of your prints dirty by leaving a layer of glue or by embedding tape fibres in the bottom layer. What bed temperature should I use with blue tape? 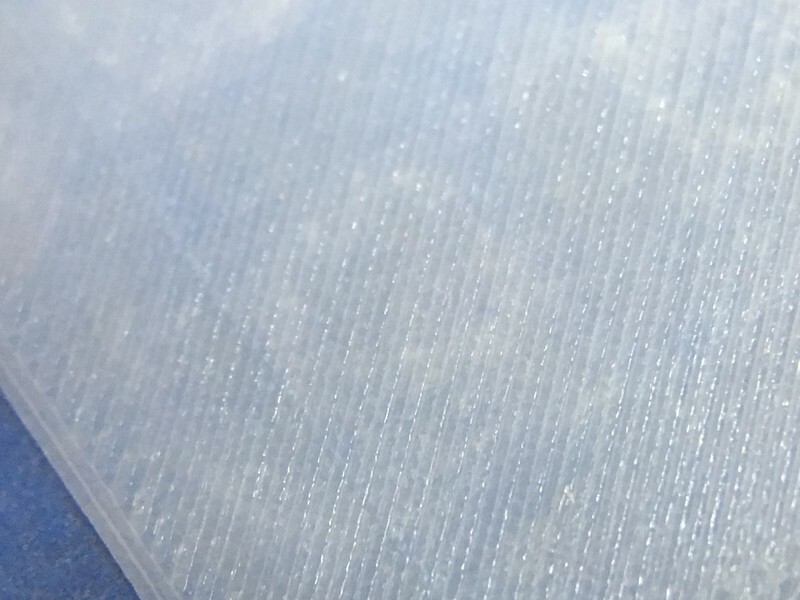 That really depends on your material, but a good rule of thumb is your first layer should be at the glass transition temperature, and then you should print the rest about 10-20 °C colder than that. A hotter first layer gives the plastic more time to spread into the blue tape and adhere to itself. A marked advantage of using blue tape is that it’s difficult to over-adhere the plastic, so you can print hotter. 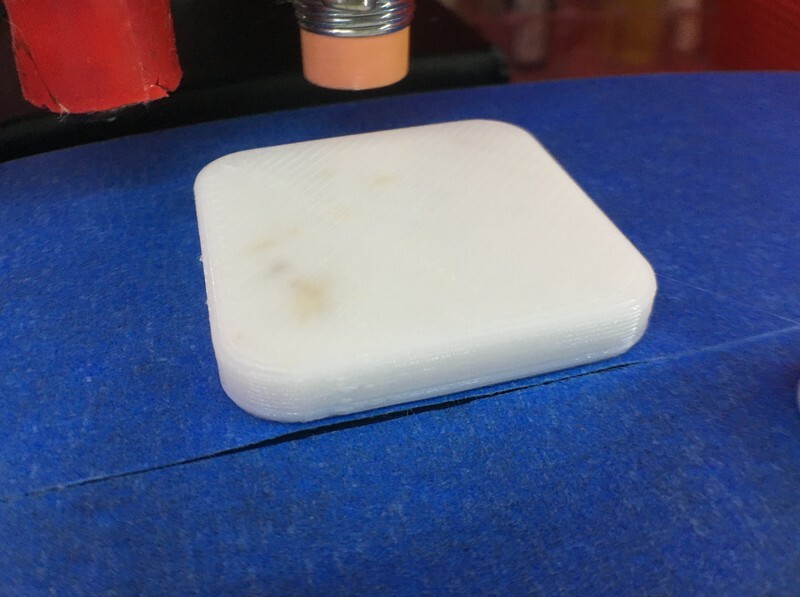 When I was printing on PEI I had to use a lower bed temperature or else the plastic would stick tight, and it became very hard to remove the print without damaging the PEI. But with blue tape I can crank the bed temperature up and reduce my warping without making the prints harder to handle. The table below shows how the corner gap (the gap between a flat plate and the corner of the test print, as previously explained) is affected by the bed temperature. In all of these cases, the part popped off the bed with an easy twist of a spudger. When I tried to do this test on PEI, I did not feel comfortable raising the bed temperature above 50 °C because the print was difficult to remove safely. In that case, corner gap was 0.06 mm on average. How do I remove parts from blue tape? Grab your spudger or spatula and work it under the corner of a print, and then give it a twist. If you need to rip the blue tape to remove the print (particularly if you’re using an unheated bed), then you should increase the nozzle distance next time. I have found that it is easier to remove prints from a heated bed than an unheated one, even when the bed is at room temperature during print removal. My hypothesis is that at the end of a heated-bed print, the plastic pulls away from the tape more uniformly as it cools. What kind of surface finish does blue tape give? The bottom face comes out matte or semi-gloss depending on how new the tape is. The layer lines are almost always visible, and the texture of the tape itself is faintly imposed. No blue tape should be stuck on the print – if it is, either you have done one of the things-to-avoid that I listed above, or the tape is worn and needs to be replaced. I personally love this finish. It’s visually pleasing, similar to many semi-gloss manufactured plastics. 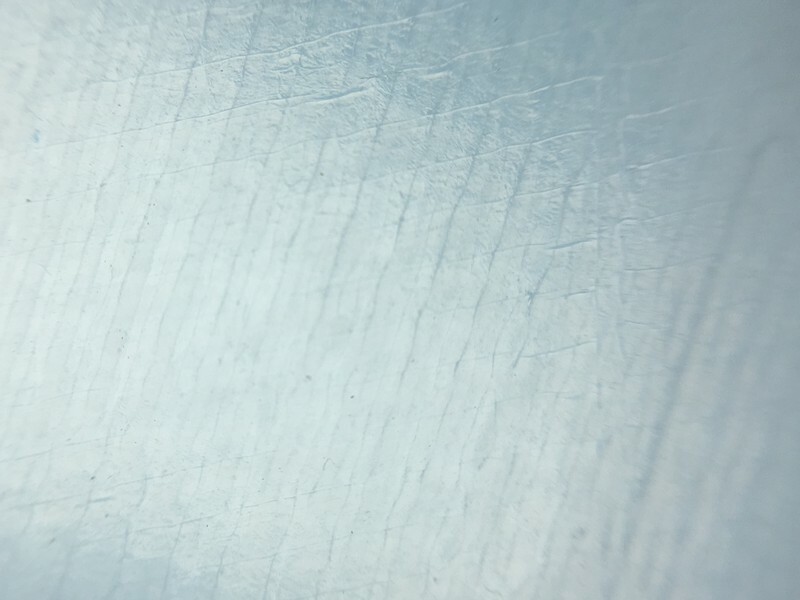 Compared to the shiny smoothness of something printed on glass, the bottom face of a blue tape print doesn’t grab your attention by being different from the other faces. The texture is pleasingly tactile like a super-smooth Kraft paper, and it fades into the background when you put other elements on top of it, like buttons and switches on an electronics enclosure. How often should I replace blue tape? Blue tape is very durable, so the short answer is that you should replace it when you feel that your current layer won’t be good enough for your print. I’ve used the same layer for two weeks and had it look like new, and I’ve printed tens of identical test objects in exactly the same position and worn it down to fibres, and it still grabbed the plastic. I’ve ripped slivers of tape up, and then just stuck those slivers back down and printed over them. But whenever I had a big flat object that I didn’t want to warp, or if I wanted a very good surface finish on the bottom face, I always replaced the tape.